Thanks to @Ghents and @El Payaso for content! 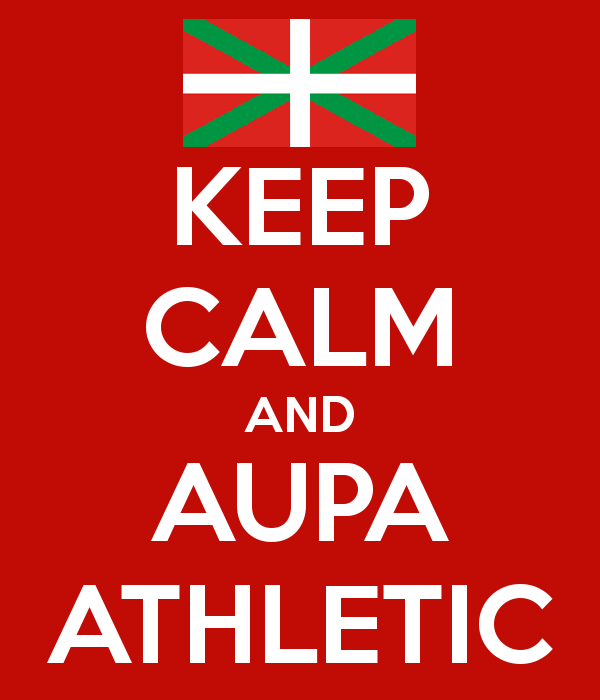 Athletic de Bilbao, historically, are the third most successful football club in Spain. As well as being one of only three clubs never relegated from the top division of La Liga – there are no prizes for knowing the other two – they are also third in the number of titles won over the years. Sadly for their supporters the last title was won, along with the Copa del Rey, as far back as 1984. Most football followers know about the long-standing Basque only policy of Athletic, which has been the subject of much debate, but I suspect that fewer are aware of the benefit that this concentration on home-grown players has had to the Spanish national squad. Athletic Bilbao has had more players representing Spain than any other Spanish club – including Real Madrid and Barcelona. The club has continued its tradition of signing players born in the Basque provinces of Spain or France, although in the late 1980s this was broadened to include players who had moved to the region at a young age. Athletic Bilbao Football Club - Founded in 1898 by a group of students from the Gymnasium Zamacois – who adopted the English spelling because they had studied in England – Athletic Bilbao merged with Bilbao Football Club, consisting of mainly ex miners from the north-east of England and shipyard workers from Portsmouth and Southampton, in 1902. After calling themselves Club Vizcaya for a season they reverted to the name Athletic Club de Bilbao in 1903. After playing in blue and white stripes for a few seasons, in 1910 they changed to the red and white they still play in today – the possible reasons for this can be found in the Atlético Madrid article, as the two clubs shared founders and have entwined early histories. During the early years, the club was immediately successful, frequently winning the Copa del Rey title. The star player of the time is still remembered in Spanish football today as the leading scorer each year is known as the ‘Pichichi’, which is named after the Athletic player who once scored a hat-trick in a Cup Final. The appointment of English coach Fred Pentland, El Bombín (the Bowler Hat) led to even more success. A great coaching innovator, who was also in charge of Atlético Madrid and the Spanish national team, Pentland was an early advocate of the style that became known in England, much later, as ‘push and run’ when introduced by Arthur Rowe with Tottenham Hotspur. He was not the only English manager employed by the club; in later years, Ronnie Allen and Howard Kendall also coached here. Their choices of headgear, though, went unrecorded! It is, however, known that Kendall found it so frustrating being unable to buy the players he wanted that it was cited as his major reason for leaving the club. Under Pentland’s stewardship, Athletic won the League – of which the team were founder members in 1928 – and the cup on several occasions, doing the ‘double’ in both 1930 and 1931. In the second of these remarkable seasons, Barcelona were beaten by 12 goals to 1 in Bilbao – a result which is never likely to be repeated. All of the games in Bilbao were played at the club’s present stadium, San Mamés, named after a nearby church. This has led to the stadium being known as ‘The Cathedral’, although the atmosphere – especially when Real Madrid are in town – can hardly be compared with one! As well as being known as the ‘Rojiblancos’ because of their colours the team is also referred to as ‘Los Leones’ (the lions) as St Mames himself was an early Christian that the lions had refused to kill. There was a period when the club had to change its name to Atlético Bilbao, as a result of a decision by Franco to outlaw non-Spanish names and languages. During the 1950s, however, the government’s severe restrictions on foreign-born players in the league greatly helped the Basque club who won several league and cup titles in this time and, in 1956, entered the then-named European Cup for the first time. The club’s successes all helped give the Basque people a sense of identity at a time when they felt very isolated in Spain. There was a famous incident in December 1975, just 15 days after the death of Franco, in which Iribar and Kortabarria, rival captains of Athletic and Real Sociedad, carried the Basque flag – illegal at the time – onto the pitch before a local derby. Bilbao finished up their 2013-14 campaign with a fourth place finish and shot to secure Champion's League football, which they did with a victory over Napoli. Unfortunately Bilbao fell short, finishing third in their group behind both Shakhtar and FC Porto then later were knocked out of the EURO by Serie A side Torino. Bilbao managed to make it to the finals of the Copa del Ray as well, but once again fell short with a 3-1 loss to Barcelona. The club were able to get redemption however, with the ageless Artiz Aduriz scoring a hat-trick in a 4-0 victory against Barcelona in the 2015-2016 Super Cup and also capturing a draw at Camp Nou later in the season. Aduriz ended his resurgent 2015-2016 season with 36 goals in all competitions and getting a call of to the Spain national team for Euro 2016. The club secured a spot in the EURO with a fifth place finish in the 2015-2016 season thanks to not only contributions from Aduriz, but also from some of their more promising first team youth players. In 2016-17 the club enjoyed another consistent season coached by Ernesto Valverde, finishing 7th in the league and requalifying for the Europa League (3rd qualifying round) for 17-18. Heralded as a potential winner of the Europa League in 16-17, the club lost in the round of 32 to Apoel Nicosia in a surprising result. Following the 16-17 season, coach Ernesto Valverde moved on to Barcelona after a successful spell at the club. Athletic made the decision to promote Kuko Ziganda from the B team to take control of the first team squad, but sadly this didn't work out and he was removed from his position at the end of the 17-18 season. For 18-19, the club moved to appoint Eduardo Berizzo to the helm alongside his backroom team. Berizzo has previously enjoyed a successful spell at Celta and a mixed spell at Sevilla previously, and is well known for his pressing style. The largest one in Spain sees you facing Real Sociedad in a Basque derby. Other rivalries are with another Basque teams Eibar and Osasuna and also competitive rivalries with Barcelona and Real Madrid. Osasuna and Sociedad in particular are also the other main producers of Basque players, but good luck signing any of them. It's exceedingly difficult to pry players from one club to the other, which is how intense the rivalry is. When playing as Athletic, you can expect to sign players on the odd occasion from these clubs, and it gets easier if you're able to build a solid difference in reputation between the sides, however even at that stage, some players will refuse the move. This is something of an unexpected challenge to many newcomers to managing Athletic, in that the majority of Basque players capable of improving the team do not want to join. 2) Only sign Basque players of any age, and do not sign any spanish U16 players unless they already hold Basque nationality. 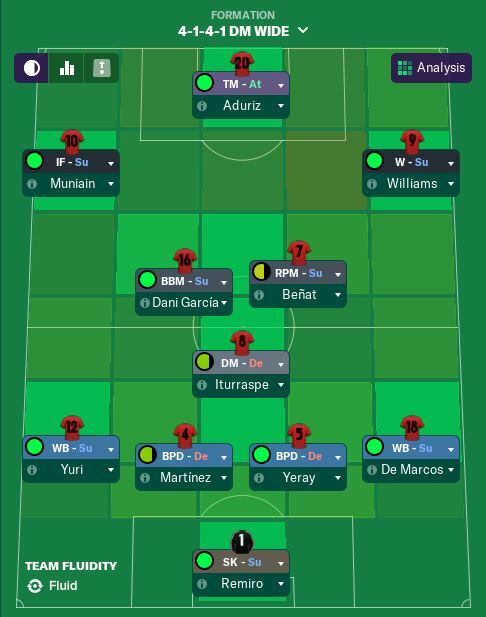 Athletic Club have one of the best youth setups in the game, so you can churn out prospects to replenish your first team and keep it home grown. You aren't buying any trophies here with a Tycoon. Alex Remiro has always been in Kepa's shadow, but can now be your first choice. He's a solid keeper from the get go and will improve. Aside from Alex Remiro, Iago Herrerin is also very capable, but given the potential of Remiro it's tough to make a case for Herrerin being the no.1, however you may prefer the more experienced approach. Alternatively you have Unai Simon - the young starlet has been very much involved with the first team in real life so far this season and has looked very capable. In game he starts at the Bilbao Athletic, but he is good enough to be promoted to the first team, especially as Herrerin starts the game with a long term injury. It's important for Simon to get minutes, so be sure to do something with him in the first season - a loan move in January could be a good move. Athletic have good depth across the defensive lines. Inigo Martinez - Signed last January from Real Sociedad to replace the Man City bound Aymeric Laporte. Inigo Martinez is a fantastic leader in the heart of defence. He's strong, aggressive and possesses excellent skills with the ball at his feet. Mikel San Jose - Can be partnered with Martinez at centre back and is also a very good ball player, however in real life has spent much more time as a defensive shield in the midfield strata. On FM19 he is natural in the DM role and can also play well in central midfield. Depending on your tactics you may wish to employ him in either area, and he will provide an excellent option in both. Not the quickest, but is definitely a solid option. Unai Nunez - Arguably has the highest potential in the defensive ranks, and now represents a fantastic first team option off the rip. He has a fantastic attribute spread and could easily slot in next to Martinez, especially if you preferred to utilise San Jose's talents in a midfield role. Yeray - Now being hopefully past his unfortunate health issues, Yeray is a very solid ball playing centre back with room to grow. It's a very tough decision to choose between Yeray and the 3 options above! Xabi Etxeita - Starts on loan at Huesca. A solid player, but with the above 4 players in the squad he's perhaps surplus to your requirements. Oscar De Marcos - The versatile player who can play almost anywhere on the pitch. The former attacking midfielder has been converted to right back and is the best player in the squad in this position. Capable both attacking and defending, De Marcos is a hard worker who not only fills the right back spot well, but can cover pretty much anywhere when required. Yuri Berchiche - Former Real Sociedad left back who joined in the summer from PSG. He's the best left back in the squad and can do a good job in a range of roles in that position. Mikel Balenziaga is a consistent, if not world class left back. He will provide a good solid option behind Yuri. Inigo Lekue - A good right back and candidate to be loaned out for the first season. You could sell him, but there would be no shortage of loan suitors and you won't need the money immediately. If De Marcos or Capa collected an injury you would want Lekue in the squad. Cristian Ganea - Another summer arrival. He is in a difficult position following the arrival as Yuri, as his position in the squad is not strong... Would recommend looking at a loan deal for the first season for him as he could be a long term back up option, but isn't needed right away. Athletic have good central midfield options which would allow a range of systems to be played depending on your preference. Ander Iturraspe - Has fallen slightly out of favour at Athletic in recent seasons but maintains a very strong ability in FM19. He is best deployed as a more defensive shield, but his reasonable creative attributes offer flexibility to play in playmaking roles if needed. Dani Garcia - A well rounded midfielder, naturally suited to a box to box role but could do a good job in a number of others. Benat - The most natural 'playmaker' amongst Athletic's midfield options. He will decline fairly quickly so you should aim to get two seasons out of him. If you want to play with a deep lying or roaming playmaker, he could be your man. Athletic have fantastic strength in the attacking midfield strata. Combined with the central options above, a 4-2-3-1 becomes an obvious options, however a 4-3-3 or similar can also work well. Similarly with plenty of strength at the back, 3 at the back with wing backs is also an option. Raul Garcia - A key player in this area, the aim is to get him scoring. He's a natural shadow striker who is also reasonably creative, so can offer a few different role options to fit your system. While he's not best suited to the playmaker role in my opinion, if you prefer to have a central attacking playmaker, he can do it. Personally, with Benat in the central midfield area, I think you have the freedom to allow Raul Garcia to focus on getting the goals. He can also play as a central midfielder and can also cover the striker role, which as you'll see shortly is very important. Iker Muniain - Iker can play naturally either wide left, or centrally. If you like a smaller, creative AMC he's a fantastic option there. This can allow you to utilise Williams on the left wing and Susaeta on the right. Inaki Williams is a pacey right winger with some room to develop at only 24, he is a natural fit for the right side, however with the experienced Markel Susaeta also looking for game time in that position, Inaki offers a good option to either play wide left as an inside forward or up top as a very different kind of threat to Aduriz, which given the lack of depth up front is very important. While this team is very heavily inclinated towards Muniain, Garcia and Williams/Susaeta being a 3 man attacking midfield unit, you don't want to overlook young Inigo Cordoba. He has the potential to improve and if developed correctly, could become a top La Liga winger. I would also recommend getting Gorka Guruzeta involved with the first team. He's an excellent prospect who could turn into a good first team option. While you're ok for season one here, this is an area of concern. Aduriz is still very capable at 37, however at that age is likely to decline throughout the season. This means you're likely to use Williams or Raul Garcia as options to rotate with Aduriz, which also allows your good depth in the AM strata to come in to play. Post season one, you're not going to get much more from Aduriz, and Raul Garcia/Williams, while capable, are not natural strikers. In terms of playing style, Athletic can offer multiple options due to fantastic variety in the squad and this is perhaps their biggest strength. Benat and Muniain in particular provide a creative option, and the team in general can play a short passing game without trouble. In contrast to that, you have the pace and direct play of Williams to offer a different option, alongside the physicality of Aduriz and Raul Garcia. Don't be afraid to play the ball in the air or get crosses in, as Aduriz and Garcia are two of the best aerial players around. As mentioned above, Athletic's squad balanced naturally suits a 4-2-3-1 due to the excellent selection of attacking midfielders, or also a 4-3-3/4-5-1. Athletic's lack of true strikers make a two man forward line more difficult simply because there's not many options to rotate. However Muniain, Cordoba, Williams and Aduriz can all do well in various striker roles, so it is possible if you're that way inclined. As you can see in a 4-2-3-1 Athletic have players naturally suited to their roles. Benat is capable as a DLP, however in the midfield strata he can act as any form of playmaker depending on your system. Iturraspe and San Jose are both well suited to provide a shield for the defensive line. It will be important to find balance on the flanks as both wide defenders can attack well, so you can position your more defensively orientated midfielder on either the right or left of the two depending on which full back you want to be more aggressive. Athletic are also well suited to the 4-3-3/4-5-1. Iturraspe or San Jose can once again shield the defence, while Benat can pull the springs. Raul Garcia isn't perfectly suited to the central midfield role, but with adequate cover behind him, he can have license to attack the box and support Aduriz, equally Dani Garcia provides a natural box to box option. Aduriz can work well in a number of roles here depending on what you wanted to achieve from the playing style. All of Athletic's central defenders can play the ball out from the back, certainly I'd recommend having Martinez at least on a ball playing role. San Jose/Yeray can play as a normal central defender if you don't want two players in the BPD role, and this can work well if you want to rotate in Nunez to sit alongside Martinez. Plenty of options there. With the 4 quality centre backs Athletic have alongside excellent attacking full backs, 3 at the back is very viable. In my screenshot you can see I've gone with 3 central midfielders, with two of them being set to move into the attacking midfield area or beyond when attacking to create runners. However you could easily have a DMC, MC/MC combo, or have two MC's and an AMC instead. Again there's plenty of options here, but 3 at the back is very viable. I always like to consider the formation as my defensive shape. The attacking shape is then decided by player roles and mentality. I prefer to have a system which provides a tight defence but then springs forward in attack with runners (e.g. going for a 4-1-4-1 or 4-4-1-1 over the first two formations I've mentioned above. This really depends on your preferred playing style and pressing style though, but Athletic's squad allows you to be very flexible with your approach. Athletic Club are a team built from within, their record of retaining their La Liga status despite only signing players from the local region is unrivalled anywhere in the world. In recent years since the world of big TV money began, with more players travelling overseas this in theory should have become a much tougher task for Athletic Club. 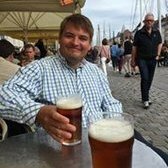 Indeed Athletic have regularly lost big name players over recent years, such as Fernando Llorente, Ander Herrera, Javi Martinez and most recently, the pair of Kepa and Aymeric Laporte, but there has always been one thing to keep things together and bring year on year development….Lezama. Lezama is the club’s academy, and of the current first team squad most have come through Athletic Club’s own academy. Some players left to develop elsewhere before returning (that is a common theme at Athletic, e.g. Benat), and you should always write buy back clauses into player sales. Athletic’s focus on youth and confidence in their academy is so strong, they often turn down the opportunity to recruit other Basque talent to give their academy players a chance. Such a philosophy is a breath of fresh air in the modern footballing world, and one of the reasons I was attracted to Athletic Club on a personal level. In game, you do have the option of signing 16 year old Spaniards to help build a stronger academy. However the purist may prefer to avoid this, and only sign players of Basque nationality at any age – this is also a great way to make an Athletic save just a touch more difficult. It basically becomes a youth academy challenge, with just a few other clubs you’re likely to be able to pluck youngsters from (who normally won't sell to you). Be sure to keep a close eye on the academies of Osasuna and Real Sociedad. This is where the best Basque youngsters are most likely going to come through, however (especially with Sociedad) be prepared to be patient or pay over the odds as the rivalry is a fierce one and player loyalty runs deep in the region. Fortunately, Athletic’s own academy can make the club largely self-sufficient. The structure of B teams and C teams in Football Manager has become more immersive and generally deeper over recent versions, meaning the reserve teams are a more viable way to develop young talent than they used to be. At the start of your save, Athletic’s youth players are split between Bilbao Athletic (B team) and Baskonia (C Team) and the under 19s team, so before making any squad changes it’s imperative you get to know the players in these teams. Some of them won’t make it, but a lot of them will provide good depth for the first team with some being able to make an immediate impact. 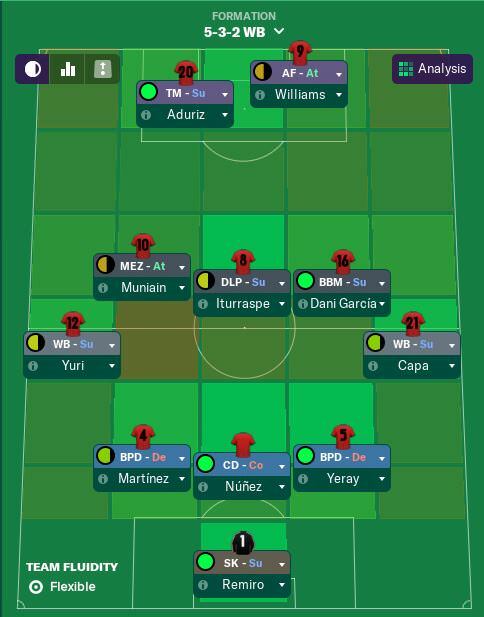 One of the biggest things when managing Athletic Club if you're new to the team, is remembering that any player could become important....when managing Athletic, you need to be flexible, you'll need players with lower star ratings for depth, and you'll need to build a tactic around effective players sometimes who might not necessarily be the best in terms of star ratings. A couple of seasons ago Bilbao Athletic played in the Segunda, a big step up from the 3rd tier. This was a great opportunity for these players to showcase their skills and challenge for a role in the first team. However the Segunda is a tough division of seasoned pros, and the young Bilbao Athletic team lacked the experience to challenge in the division and were relegated. Even with that, some youngsters really showed their quality and have earned their opportunities with the first team. Others were either loaned out last season to Segunda clubs to continue their development, while others stayed with the B team in Segunda B.
Baskonia play in the regional division, and to be honest, in game I tend to use them as a dumping ground for those players who are realistically never going to contribute to the first team as their division is inactive. However at the start of the game the team has a number of potential first team talents worth keeping an eye on. I won't post specific screenshots of players as most (both B, C and under 19s) have a variable potential that could land anywhere within a set range, meaning the same player on one save could be a Segunda level player, while in the next save could be a solid La Liga prospect. It's down to you to keep an eye on these players and track their development - just because someone only has a 2 star potential, don't dump them.....loan them, get them games and the right training schedules, they may contribute in the future. Please note, players will sometimes begin each save in different reserve teams and with different potential ratings, so don't take the below screenshots as gospel. I have also cut any very low star ratings to save space on the images. Unai Lopez (attacking midfield) – A bright talent at Lezama and he has played plenty of first team minutes already. For a few years now on FM he was the brightest youth talent at Athletic Club. This year that is perhaps no longer the case, however Unai Lopez still has the potential to be a good first team player for some time. Sadly his window to be a leading player may well have passed now, he could be useful. You may find better options in the transfer market and wish to move him on though. 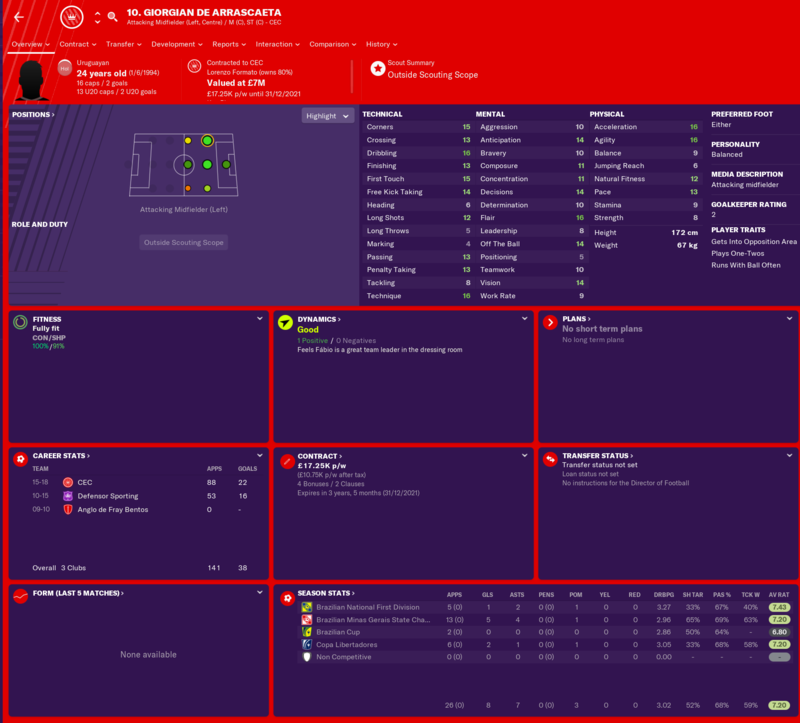 Peru Nolaskoain (utility/midfield) - A player who has shot into the limelight in real life this season and is now a first team regular. His impressive flexibility to drop into central defence despite being known as a midfielder has been a shock this season. 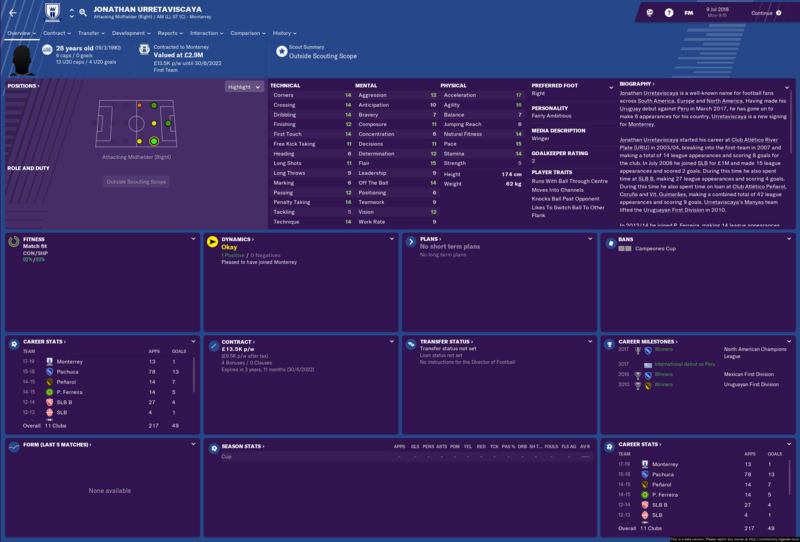 Sadly his rapid rise has come a little too late for a big buff for FM19, but he's still strong with room to develop. Personally I can't see the space for him in the first team in game, but with an injury crisis he would do a good job, otherwise a loan move to give him segunda minutes would be a good option. Unai Simon (Goalkeeper) - Starts at the B team but can be promoted to cover for the injured Herrerin. Needs minutes so be sure to play him occasionally or get him a loan move. Prior to Kepa's departure and Herrerin's injury he was loaned out for the season in real life but was then recalled. Unexpectedly he suddenly became first choice when Remiro had a falling out with the club over his new contract. He's shown signs of real quality in goal this season and has potential in game to match. 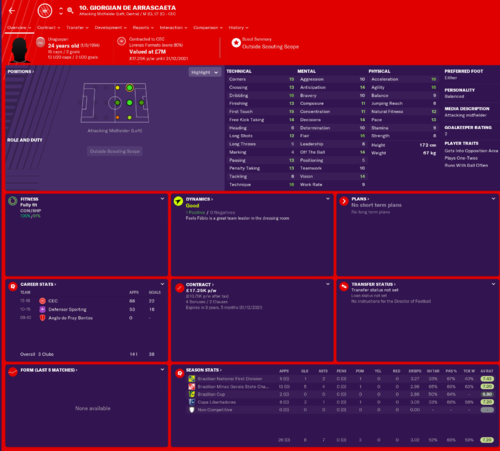 Oihan Sancet (midfield) - In real life, perhaps considered the brightest young talent at Lezama and arguably the best Athletic Club youngster on FM19 as well, who caused a stir after signing from Osasuna (which very much upset the Pamplona based club). In FM his potential is definitely there. He is ready for the B team at the start of the game (starts in the C team), but would benefit from being around the senior pros. Having him in the first team squad but available for the B team is a smart play, and you could use him on occasion for the first team in cups etc as well to boot. Gorka Guruzeta (attacking midfield/striker) - Has the potential to slot in as suggested with Sancet above, with a place in the first team squad and games for the B team. Given Athletic's weaknesses up front he may just be worth a look for some first team minutes. Inigo Vicente - The tricky wide man come striker has potential to perform really well - he could be the kind of player who outperforms his star rating based on his attribute spread. Juan Artola - Right winger, good attribute spread and potential. Ruben Azcona - Talented striker who has broken all sorts of Lezama records, hopefully not another Villalibre who has stuttered significantly. Doesn't seem to have massive in game potential but worth keeping an eye on. Nico Williams - Isn't having two Williams brothers in the first team a dream? Naturally there are a lot of players with variable potential, so keep an eye on your youth squads and see what you have to work with once the game is loaded up. Don't write someone off based on star rating! There two main ways you can play as Athletic, either buying up 16 year old Spaniards to hoard talent and make sure they gain Basque nationality, or working carefully with the Bilbao academy players and signing players from the region. Either way, Lezama is an important part of Athletic Club and something that must be taken seriously. When you can only sign Basque players, developing strength in depth is much tougher than at other clubs. If a player is only 2-3 gold star potential, don’t discard them….work with them, develop their key attributes so they can effective first team players, and they may just surprise you. If you're playing as Athletic for the first time, and you're used to signing players based on star ratings to squad build, be prepared to change your approach...you'll need to utilise everyone! If you are keen to also recruit Spaniards of 16 years of age, you can just adjust the youth filters by adding "Nationality is Basque OR nationality is Spanish", Age is at most 16. That will allow you to see Spaniards who you could sign who would then gain Basque nationality later. Make sure you immediately scout all youth players from Eibar, Real Sociedad, Osasuna, Alaves and any other Basque clubs who are doing well on the game. I then use the general player search screen to find anyone who has appeared at another club. I look at a combination of star rating and attributes once the scout has 100% knowledge. Generally I won't pursue anyone with less than 2 gold star potential. Above that, 3 gold star or above potential I always sign, 2 or 2.5 I base it more on the attribute spread and my general feeling on the player (e.g. whether they look pretty good already and perhaps the scout is wrong, or whether they might fit a certain role and perform above their level later). If you are signing any Spanish 16 year old, you can probably be a bit more picky. Once I feel I may sign them but don't want to pull the trigger straight away (or can't), I add them to my shortlist and re-scout every month to see any changes in price/wage or ability. You can of course add a few extras, however I tend to find after the first couple of seasons any outliers (e.g. notable Basque players who have moved abroad) you know of anyway and can scout separately. This combined with the player search filters should mean you don't miss any potential talent. Aymeric Laporte - Now at Manchester City following his sale this January. His wages are within range, but his availability will depend on how he gets on at Man City, definitely a chance here if he falls out of favour at City. Javi Martinez - Former Athletic player who left on quite bad terms after buying out his own contract to join Bayern. Injury prone (knee problems) and expensive, he presents a risk. However in previous FM's has often become available after a season or so. If you sign him, expect cruciate ligament injuries regularly, but if the club is doing well financially he could be worth the risk. Given Yeray and Unai Nunez coming through, the requirement for a defender like Martinez is lowered. Cesar Azpilicueta - It will cost a lot to bring him in, but he's a player who brings immense quality, and can play anywhere across the back line. Following the additional of Yuri this year, and Azpilicueta getting a year older, signing him this year seems less important than previous years. That being said, he's so good you'd be an idiot not to have him if available. Ander Herrera - The Manchester United midfielder, formerly of Athletic is looking more likely to return to Athletic at some stage everyday that Mourinho is at the helm at United. In game, given United's strength in midfield it's very possible a lack of game time will see him wanting to move on. With wages within Athletic's budget, it's definitely a possibility and he would offer real quality over a number of years, with more longevity than Benat. Alvaro Odriozola - A player who has shot onto the scene in the last 12-18 months. He went to Madrid this summer for around 35million euros so will be difficult to pry away from there. If he falls out of favour, a move for the young right back would be a must. These guys basically fall into their own category, because signing them can be almost impossible. Asier Illaramendi - An excellent deep lying playmaker, who at 28 has years ahead of him. Arguably not an improve for Athletic but definitely a good player. Mikel Oyarzabal - An attacking midfielder with massive potential. Given Raul Garcia is ageing, and Unai Lopez looks likely to be a decent option at best, if you were able to bring in Oyarzabal it would be a real coup as he could hold down that position for years. Ruben Pardo - Good central playmaker, probably a better version of Unai Lopez and is only 25. Aritz Elustondo - Another basque right back...If you wanted a more defensive option he's well worth a look. Will be a good La Liga player for a long time so a solid addition for any squad. Mikel Merino - Following his transfer to Sociedad this summer and continued snub of Athletic, there will be some work to do to get this transfer done. Most realistic chance would be if he moved to another club first. A strong midfielder who would provide an excellent option though if available. Has an achievable release clause though! Igor Zubeldia - Solid deep lying playmaker type. Young player who can be a starter/rotation option if you're able to get him in. Especially with Benat getting older with a tendency to decline, a solid playmaker like Zubeldia may be a good fit for you. Jon Bautista - The striker is a rotation option at Sociedad and is likely available in the first window for a few million. A roughly 3* striker who could provide good back up for Aduriz in the first season. Personally I decided to give the minutes up front to Garcia, Williams, Cordoba and Guruzeta as I didn't feel Bautista would offer an improvement on them. Realistically, the best chance you have of signing any Sociedad players is if they get snapped up by a big team, but then don't get game time. There are a few others less talented players who could become good options, but realistically you are likely to have better prospects through the academy at Athletic anyway. Given Athletic's squad is largely capable, there aren't many options out there who are worth picking up at the start of the game. However Athletic have a decent transfer budget at the start of the game, so if you had a few bad injuries in pre season, the following could be potential options. Roberto Torres - The Osasuna man is too good for Segunda football, he would provide good cover in central and attacking midfield but wouldn't improve the team in his own right. If Benat got a bad injury, he would definitely be worth a look. Antonio Otegui - The Osasuna central midfielder is a youngster at 20 with development required, however he could provide a good depth option and is a prospect as a future first team player. Should be a realistic option for the first window. Isma Lopez - Ex Athletic academy player who has been at Gijon for a number of years, now plying his trade in Cyprus. A left back who is on a similar level to Ganea. If you didn't fancy Ganea, Isma Lopez would offer a more attacking option to Balenziaga on the left side. Not really necessary though. 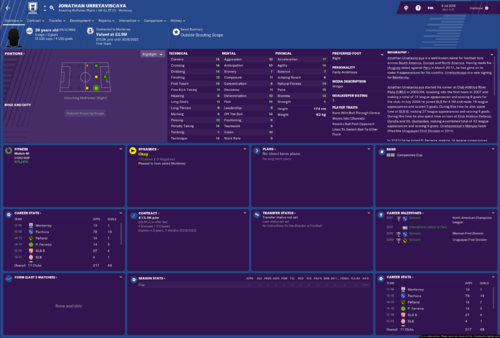 Jonathan Espericueta - The mexican with Basque nationality...you will need to set specific database options for him to be loaded into the game. A decent prospect, but worth noting due to him playing in the Mexican league. Be sure to load him up, he could be useful! I've not seen him on FM19 yet but assume he's still good, will update later! Stephane Ruffier - A french basque who is a goalkeeper for St Etienne. A very good player and given the loss of Kepa, would be worth scouting. Realistically Remiro and Simon have good potential and should be given the chance. Nacho Monreal - The Arsenal left back could be picked up, but he's not young anymore and with Yuri around there's not much need for him. Javi Martinez - No, not THAT Javi Martinez! There's another one at Osasuna who players as an attacking midfielder. Good potential, available immediately. Players like Otegui and Javi Martinez are no brainers to bring in as development prospects, but outside of that Jon Bautista is probably the most likely first window pick up given the lack of options in the squad up front. Jon Bautista - At Sociedad, decent enough but never going to be world class. Can be a good depth option for a few years. Kenan Kodro - Another depth option who can come in and rotate minutes to fill the gap. When you start the game, always check release clauses throughout the team. The last thing you want managing Athletic is not being aware a players release clause is within reach and losing them unexpectedly. The two standouts initially are Nunez and Yeray, you MUST tie these guys down with much higher clauses as soon as possible. Alex Remiro needs a new contract anyway so you can bump that one up, and Inigo Cordoba is ok at 27million for now but may need some adjustment later. When negotiating contracts, increase the clause to what you want it to be and lock it on the first negotiation. They'll ask for more wages but that's ok, you can't risk losing good players and finances aren't a big problem at Athletic. If you don't lock the higher clause, they may respond by locking a much lower value. 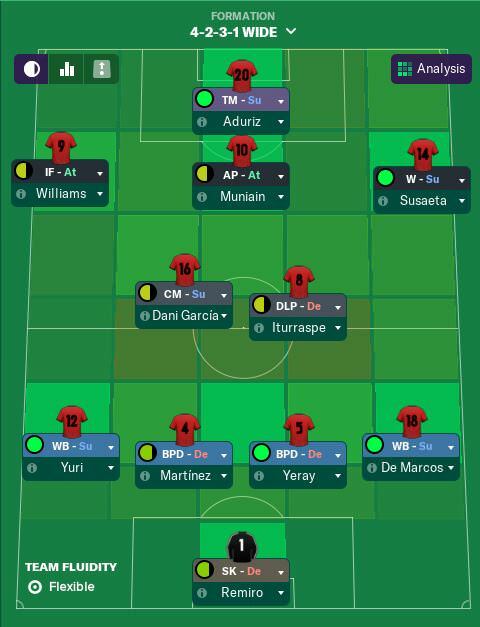 Athletic in FM19! What a time to be alive! Not sure what happened either, but I'll re-add summaries of my first two seasons later. It's always the first game I play and there's always scope to challenge the two giants of La Liga. It's also a good challenge as the mainstays of the squad (besides Munain) are all ageing that little bit more, so you really will have to replace players in the shorter term. Athletic will always have a special place in me. A light in the dark modern football world today. Will follow this for sure and might start a save myself sometime. Was hoping to be three seasons deep into a River Plate save but beta was too buggy for my liking, definitely thinking of Athletic for my first save on the full game. Perhaps a youth-only one where I would accept release clause bids for the likes of Martinezbut otherwise renew until they retire / decline past usefulness, but not sign other non-HG(club) Basques. What sort of a database setup have you guys who do long Athletic saves generally use? Thinking perhaps something similar to what Makoto Nakamura has done on his career thread with a lot of view-only leagues, seems to still have a decent transfer market. 2018-2019 - not a great season, probably could've been fired at one point given that we were flirting with relegation by Christmas, but we rebounded well to finish 13th in the end. In terms of transfers, Bautista came in from Sociedad and Balenziaga/Lekue were the main departures. 2019-2020 - this was more like it. We were always around the CL places, usually hovering around 5th-6th but not too far off the clubs above. An excellent end of season run saw us pip Valencia to 3rd. So you're probably thinking, "wait that means one of the big three didn't make the CL". Indeed, it was Barcelona who missed out! Transfers in were mostly Basque regens, including two hefty transfers for attacking central midfielders who should kick on for a starting place soon. Aketxe returned to offer cover anywhere across the attacking midfield positions. Out were some of the ageing players in decline - Herrerin, Garcia, San Jose, Capa, Benat. The talented youngsters already at the club - Vivian and Nolaskoain are in the first team squad, whilst Sancet has been out on loan for two seasons. 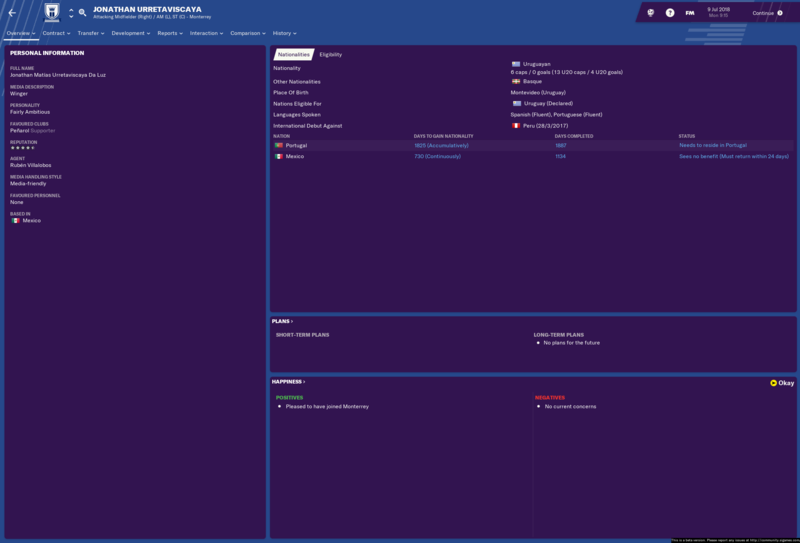 Just starting the 2020-21 season and we have an exciting new buy. In fact, I had to beg the board to cough up the money since despite being in the CL and with a net spend of -10m for the Summer, we didn't have much in the way of transfer funds. But welcome Mikel Merino. He was transfer listed by Sociedad but they'd only accept his 25m release fee. Because he was so determined to leave, he was willing to overlook the rivalry. The club are aiming for the Europa League but I reckon we should go one better again. There's always one CL spot each season going usually and why shouldn't it be us? I expect this game to a bit harder. The only players you may get is Ander and Bautigol in the first years. I already grabbed them both and some prospects so I hope I can get an European place with them. Can't wait to kick back on with FM19. I got burned out of 18 real fast, but the new tactics/training seem awesome for developing Athletic. Thinking about a 3-5-2 or 5-2-3. Hell, looking at the still lack of striking options might even dabble in some strikerless. Our CL experience was chastening. One win from six games and we didn't even drop into the Europa League. On the transfer front, just a few youngsters joined but annoyingly we lost two youngsters to Arsenal and Athletic Madrid on relatively low release fees. Let's hope we can get them back in a couple of seasons. Another youth prospect has complained about lack of game time. He's played 24 league games. A year left on his contract and Lazio are sniffing around. We can't afford to lose him too as we might be moving Garcia/Iturraspe on soon. It looks to be one of those transitional Summers. What I wouldn't give for a striker! Lack of goals is a serious issue. For the striker issue, you can consider picking up Kenan Kodro (2,5 star C / 3 star P) in FC Copenhagen, I picked him up before second season, using him and Bautista as rotation. Besides that thanks for a good guide :) I will follow. I ended 5 in my first season. I did some youth signings aswell..
+several loans for the young guns and the ones in 3rd row. Bautista does OK for me, never more than 10 per season in the league and never averages more than say 6.8. He can go several games without scoring. Obviously if a better striker came along he'd sit on the bench. I don't think playing Williams up front works any better tbh, and you lose what Williams provides on the wing, especially as Susaeta doesn't last long. For the striker issue, you can consider picking up Kenan Kodro (2,5 star C / 3 star P) in FC Copenhagen, I picked him up before second season, using him and Bautista as rotation. Besides that thanks for a good guide I will follow. Yeah I've always looked at Kodro and Bautista and decided to give minutes to my own youngsters to help their development instead. I don't think either offer much more upfront than say Cordoba or Garcia would. I always try to avoid signing back up players. I can add Kodro to the guide though as he's definitely a decent option! I've decided to start a new Athletic save - have one every year, varying between 4 months and 4 years it seems. After my league successes with Real Sociedad and a bunch of Argetine imports on 18 I think its only right to try and better myself by doing it with the more restricted team. Plus, could never get Yuri back on that save and we have my favourite player from that save, Martinez, now at San Mamés. 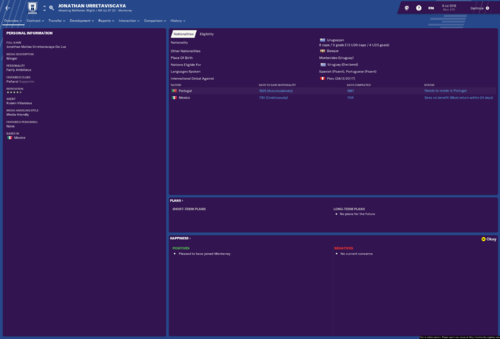 Was going to be youth-only, but now I've had a slightly different idea - unlike in the above post, I'm not even going to try to sign players directly from our rivals. I'll only sign Basque players from outside of the Basque region - so if they've left (i.e. Ander Herrera, Alvaro Odriozola) or that one great Basque regen that Barcelona always seem to produce. The aim is to keep the region strong, whilst hopefully making us the strongest. Not sure yet what I'd do if another club triggered the release clause of a Sociedad player and I also had the money available though. Anyone signed this Uruguayan chap with Basque second nationality? Right sided midfielders aren't really a priority with Williams and Susaeta in the squad. Can players gain Basque nationality ? He's definitely of Basque descent so an eligible option. what i mean is if a foreign player played for say Real Sociedad for a couple of seasons would they gain Basque nationality or just Spanish? An adult would only gain Spanish nationality. Basque nationality in-game is effectively a way of coding a player as eligible for Athletic. 16 year olds can get it because in real life Athletic accept people who move to the area young - Aymeric Laporte only had a Basque link through a great-grandparent before he moved to the French affiliate club. Similarly there was a debate about the eligibility of Griezmann should Athletic have tried to move for him, as he's not from the Basque country, but joined Real Sociedad aged 14. I was not aware of this gentleman, looks alright though! Another Uruguayan playing in Brazil with Basque second nationality. Really? I loaded the Brazilian and Mexican leagues - also to take a look at Espericueta - I'm probably not going to sign any of them as they're not massive upgrades but all three guys should be signable. De Arrascaeta should have Basque second nationality - he did for me. I was able to bid. Yeah double checked and he didn’t have it...how weird! @dothestrand @bowieinspace might De Arrascaeta be a bug? I've scouted him loads on the past two FMs and he never had it. But he does on my current save. I don't recall him having it on my brief beta save with River Plate where I'm sure I scouted him as well. His wikipedia claims he has Basque descent but the two articles listed as sources at the end of the sentence both only mention his holding an Italian passport as they're about potential transfers to Roma and Inter. I'd be conflicted about signing him to be honest given Athletic generally only go for people who weren't born in the region if they were trained in it. A really good first league season saw us amass 78 points and finish a strong 3rd. We never threatened the league title but managed to comfortably finish 3rd in the end. Stand out players were Yuri with the highest average rating, and Raul Garcia who was my top scorer with 10 goals. Goals were very well spread throughout the team, Cordoba looks set to be my new centre forward and will be rotated with Inaki Williams. I did extend Aduriz's contract for a year but I don't think he'll see too many minutes. Outs: Mikel Rico, Markel Susaeta, Mikel Balenziaga, Unai Lopez. I had a rather good youth intake with these 3, including my personal favourite name...Borja Borja. How did you get Merino from Sociedad? Release Clause? Yeah tough grind...I've got 35million GBP in the bank and Champions League football. I think I'll get money in January, which could suit because at the moment Real Sociedad aren't budging on Oyarzabal and Real Madrid are the same with Odriozola. I am hoping that by January Oyarzabal will have had enough of the Segunda and will request a transfer, and Odriozola will be bench warming. I have managed to do a little bit of business this window, selling Benat for 1.9million and replacing him with Igor Zubeldia for around 3 million pretty much all in installments. Very simple decision as Benat was declining and in his final year of contract, Zubeldia is 22 and a solid defensive midfielder who fits my system. If I need to raise funds to bring in Oyarzabal then San Jose and Raul Garcia may be sacrificed. I wouldn't sell San Jose. He is a good Leader. Last year's edition, he broke up almost every issue I had with the players. It seemed last year that getting a Team Leader to talk to a player was OP...might have gone the other way now, I've not had it work yet. Although, a lot of the complaints on my beta save were a bug leading to too many players requesting loans. Did any of you change the staff much? 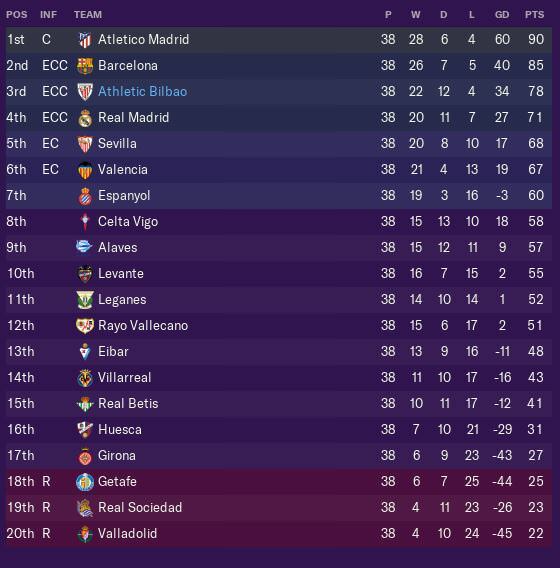 I sacked all of Berizzo's imports, my HoYD and an u19s physio and have brought in exclusively Basque or English (my nationality) staff - none of those *shudder* Spaniards getting into the club if I can help it. Might have limited me slightly but I've still managed to have the best Technical and Defensive coaching rating in the league. Oh, and I got Bixente Lizarazu onto the B team staff. Doesn't seem like Joseba Etxeberria is coming back though, sadly. I'm making former Sociedad captain Xabi Prieto a member of my u19s staff though, one of my favourite players from my FM15 save with them, one of those guys who now I know he's available I'm probably going to sign no matter where I manage. I have changed a bit of the staff. I will post a screenshot when I'm back in the save. San Jose could be an absolute weapon off set pieces, with 15 jumping reach and 18 heading (or maybe its the other way round) - I've just changed my corner routines as I noticed the default had Aduriz on "lurk outside area" which is ridiculous. So now its a far post routine with the aerial might of San Jose (attack near), Yeray (mark keeper), Martinez (attack far) and Aduriz (attack deep). No goals on the first run out (an away game against Real Sociedad in the cup) but if I actually train it we may see some. Frustrating I didn't notice the absurdity of the default earlier, a 0-0 draw at Huesca where we couldn't break them down may hurt us come the end of the season. I like Bautista, won't sign him though because of my philosophies. Is Unai Bilbao still at the club? I always like to have him on the books what with him and the club sharing their second names.